The beggar Lazarus at the door of the rich man. I'm back from Trujillo, Honduras and settled in to my summer ministry here at St. Peter the Fisherman in Eagle River, WI. While I'm back I must also say that there is a special place in mu heart for Trujillo, the people there and the wonderful missionaries from Christ the King Parish in Little Rock. I'm proud to be part of this wonderful team. What message do I bring back from Honduras? My thoughts go to a parable found in Luke's Gospel, chapter 16:19-31. 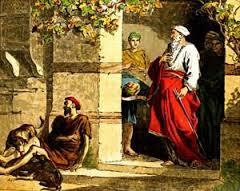 It is the story of the poor man Lazarus who is outside the door of a rich man's house. The sin of the rich man is not his wealth. His sin is the lack of awareness that the poor man is there. Having served three years in Bolivia and having visited Peru, Ecuador, Costa Rica, Jamaica and now Honduras I can verify the claim that 75-80% of the world lives more like the people in those countries than like we do in the US, Western Europe and a few other places on this planet of ours. Are we aware of that fact? This question is not just mine. It was raised by Pope John Paul II in his homily at Yankee Stadium in 1978, using the same Gospel parable. In raising this question I am NOT trying to evoke guilt in anyone for being American or wealthy, etc. Likewise I am not simplistically assigning blame to anyone because there is plenty of blame to hand out not only to wealthy nations and corporations but also to corruption within the poorer countries. What I am suggesting is that by becoming more aware of the situation we begin to commit ourselves to finding the solution. Some might be thinking that there is no solution or that it is too idealistic to think that way. To some extent such criticism is valid. On this side of the Second Coming we are not going to solve all of the world's ills and injustices, but we must try. We must strive to create a more just world. Our faith (and not just politics) demands that of us. The goal I have in mind is not some sort of socialist utopia (which really can never exist) where everyone has the same but rather a world in which everyone has access to all of the resources that the Creator has given us. For example, some of you know that a few weeks ago I took a bad fall and ended up in the emergency room in St. Petersburg. I was well cared for in a state of the art, highly computerized emergency facility and am just about fully recovered from my injuries. While in Honduras with dedicated doctors and surgeons from Little Rock who gave their best to the people in Trujillo the conditions at the hospital there were sub-standard even compared to some of the poorest facilities here in the US. I considered myself blessed to have received the treatment I did but wondered why there can't be such facilities in Honduras and other places. Another faith dimension of this issue is the fact that as Catholics we believe that as Church we are the body of Christ in the world. This faith belief unites us to all members of the Body as brothers and sisters in Christ. 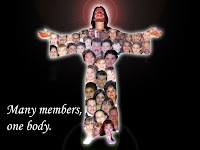 Even beyond actual Church membership we are united to the entire human community as children of the same Creator. The goal and the task is a daunting one, but let's begin by at least being aware of the many beggars at the gate. Below are two pictures taken from a Mass I celebrated at a prison facility in Trujillo. The conditions there were deplorable, but there was also genuine faith in many of the inmates. They are part of the Body of Christ as well. I am looking to return to Trujillo again next year. Together with the medical and other missionaries from Little Rock we have much to bring to the people there and they have so much to teach to us. As Catholics we believe in faith that Christ is truly present in the Eucharist. That is something, as they say, that you can take to the bank. Christ is also present in other, more subjective and personal ways, but truly present nonetheless Last year when I visited here you may remember that I was touched, as were other missionaries, by a young woman with cerebral palsy who could not talk, but when I asked her if she knew Jesus, she pointed to the Crucifix on the wall. One year later,yesterday afternoon to be exact, I visited her again. Her family was happy because the mission had just procured a wheelchair for her. I was deeply moved when she looked up at me and smiled and then proceeded to pull me towards her and give me a big hug. All I can say is that with this hug I felt Christ pulling me toward him. It is an experience I will never forget. When I said goodbye to her and her parents I looked at her smiling face and saw the face of Christ. It's been another busy day in Honduras. With this entry I'm going to let the pictures do the talking for the various places that some of us visited during the day. Today began with a visit to the Trujillo hospital, but before I mention what I did let me tell you about the wonderful team of doctors and nurses that are giving their time there during this mission. The Christ the King mission serves those who cannot afford medical care. All sorts of surgery from routine to absolutely life-saving stuff is offered under sometimes difficult circumstances. This week,for example, the x-Ray machine is not working. All of this makes me appreciate the kind of medical care I have received in the US over the past few years. As for myself I traveled with the hospital team early this AM and anointed all of the patients awaiting surgery with the Anointing of the Sick. I also visited wards for men, women, children. There are no private rooms. I anointed or prayed with each patent. I encountered many heart-breaking situations in the children's ward. I then moved on to la Colonia and the blessing of a renovated church, superbly done by the construction team members. It was a truly joyful celebration. beautifully Wednesday is a half day for work so we enjoyed a nice fish or chicken dinner at a seaside recreation area. The ocean and a pool were available to us. Finally we celebrated Mass at an orphange run by Franciscan Sisters. It is a place that is wonderfully run by a loving staff of sisters and lay people ans well as several terrific volunteers from the states many of whom give two years of service. It was a great day and we're looking forward to tomorrow. Chapel at Finca de los ninos orphanage. The past two days have been a real blessing here in Honduras. I have had the privilege of participating in two "encuentros", formation sessions for the lay leaders of the local communities here. During the sessions a lesson prepared by Fr. Felipe Lopez, the local priest, is shared. The floor is open for discussionb of the various points in the lesson. The sharing of the participants has been tremendous, revealing a deep-seated faith rooted in their lived experience and daily struggles. The picture here show the Mass at the Cathedral on Sunday night and some scenes from the encuentro at the community of Santa Fe. The Santa Fe community is made up largely of Garifuna people. Those who saw this blog last year may remember that they are a people of African descent whose wandering history from slavery to settlement on a remote Island to the coast of Central America is quite interesting and inspiring. They are Hondurans who at the same time have maintained their native culture. The video clip below shows them singing during the encuentro. By the way my luggage and all of the lost luggacd arrived OK. Looking forward to the visit tomorrow to the Finca de los ninos, a local orphanage run by Franciscan sisters. Just as I was preparing a blog journal entry yesterday the internet went down, so let me today tell the story with pictures and few words. yesterday, Sunday, our evangelization team visited two of the sites where we will be conducting encuentros (formation sessions for local lay leaders. The evangelization part is integrated with the medical so we got to witness the work of the fine doctors,nurses and desntists who are here. This morning I went with seminarian Joseph Friend to visit the hospital and give the Annointing of the Sick to patients awaiting surgery. then it was on to the town of Maranones to spend the day visiting clinic patients, visiting homebound people and joining with local priest Felipe Lopez in conducting an encuentro there. More pictures to follow, taken by others, that include myself in action will follow. Greetings one and all from Trujillo. The first group of us arrived safely last night but not without problems. United Airlines was frankly a mess because 5 of our group didn't get on the plane and some of our luggage, including mine, did not make it. Nonetheless we did arrive and began our time here with Mass for the Feast of the Sacred heart. It was a time to put aside our travel frustrations and place ourselves in the loving hands of God to begin our time here. Today, Saturday is a day of rest and preparation as we await the arrival of the rest of our team (and our luggage) this evening. Tomorrow out work begins and there will be pictures from the sites where we are working. On Sunday we celebrated the Solemnity of the Most Holy Body and Blood of the Lord, This feast goes back to the thirteenth century when the belief in the real presence of Christ in the Eucharist was being questioned. And guess what? It is still being questioned in some circles. With good reason the Church continues to affirm and defend that belief. Nonetheless there are some other aspects of Catholic Eucharistic faith that I believe are not discussed often enough. In highlighting these I think that some who question belief in the real presence would come to understand it better. One issue is that while we keep affirming Christ's presence in the Eucharist we don't often ask "What is He doing? How is He engaging us." You see if one is really present to another there is some sort of involvement, engagement in the life of the other. Here in our Diocese of St. Petersburg our bishop, Robert Lynch, had a wonderful 3 year catechesis a few years ago in which he underscored the 3 movements of Gathering, Nourishing and Sending that take place in the Mass. We, the People of God are gathered by the Lord, a gathering that begins when we go out the door of our home and continues up to our gathering as a congregation. In this He is already present among us, though not yet present in the Eucharistic bread and wine. The gathering continues until we are gathered into one by the Holy Spirit following the consecration. We affirm this at the greeting of peace, a gesture celebrating our union with Christ and through Him to each other. The nourishing is ultimately the reception of His Body and Blood in Holy Communion, but even before that we are nourished by the Word and then drawn into the mystery of His death and resurrection, the source of our nourishment. The sending results from our own consecration. Many Catholics fail to realize that just as the bread and wine are transformed into the Body and Blood of Christ, so too are we, the Church. The difference is that we are called to say yes to that truth. For most of us that is a lifetime project. We sin. We fail. We resist being transformed, but insofar as we are transformed we are sent into the world at the end of Mass to bring to the world what we have celebrated at the altar. Go in peace, glorifying the Lord by your life is my favorite form of the choices given for the dismissal rite at the end of Mass. The dismissal is a sending or missioning. With every Eucharist we grow more and more into the image of Christ. The Body of Christ then is the Blessed Sacrament, but it is also we, the Church. That's really something to celebrate.